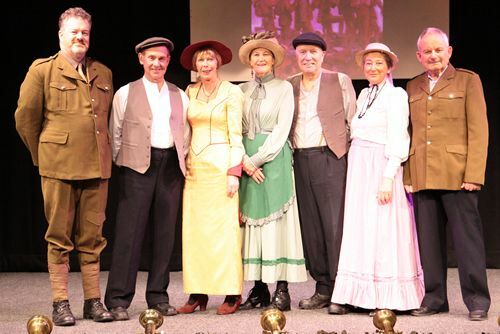 Firstly, we would like to thank all the folk from Husthwaite who turned out to watch the play and also to support the villagers who were in the cast. ‘On with the motley!' bawled the Sergeant Master of Ceremonies at the beginning of the Easingwold Players production of Blame it on the Kaiser. And we poured on stage, the whole cast, to sing and to dance to ‘Oh it's a Lovely War'. You know that when the Players put on a show directed by David Goodwin you are going to witness something special. Known throughout North Yorkshire and beyond for his professional performances, David added a powerful community ingredient this time. He took the risk that we, his ‘motley' crew, would deliver his daring and ambitious vision ... a revue marking the end of WWI. David had appealed for first hand information about the war. The community - Easingwold and the surrounding villages - responded with diaries, letters, photos and newspaper clippings. He had enough to create a script based on material provided by local families. The Husthwaite WI somewhat reluctantly joined Mrs Pankhurst in demanding votes for women. As ever, Husthwaite community drama group contributed to this fine play. We all had several parts; it was that kind of production. Here are some of them. Robin Walton, keen to be involved and give support, came straight from her chorus work in York Opera's Carmen to join the singing. 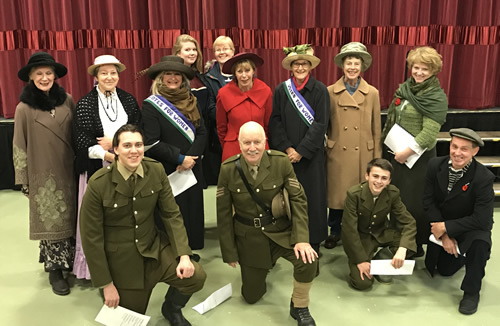 Mary Hill rallied the men of Easingwold (including those in the audience) to join the army or be ashamed of themselves. John Law, recently an Ugly Sister in our Cinderella, sang a beautiful duet with Delia Madgwick: ‘If you were the only girl in the world'. An emotional moment for him when the audience joined in. In the audiences were families of soldiers with frightful stories to tell. Cameron Smith was Arthur Abel, a local man, a survivor of the Somme, who described how he and his mates on a long march were allowed to bathe in a river. The audience began to giggle. Cameron controlled them with the depth of his emotion as he described sharing a memorable moment ‘just me with this most magnificent fish'. The relatives of local man Blythe Wiles came to the play. He went over the top, saw friends wiped out and had both legs damaged beyond repair. I was the bored medical officer who coldly informed him that the artificial limbs I was supplying were ‘the property of the ministry' and he would have to pay for any loss or damage. Lawrie had pivotal roles, too, in scenes of comic relief. First he was Blackadder's cook, Baldrick, with his trademark ‘cunning plan'. Then he was hissed and boo-ed in his role of evil Squire with his plan to seduce and abandon an innocent maiden. That was in a contemporary melodrama, A Trouble Shared. It ended with Squire Lawrie brought to the floor in slow motion combat with Two Heroes. Cheers and applause from the audience. The men had almost won their war. Mary, playing the suffragette Millicent Fawcett, was passionate about that other war. She appealed to the nation's women: prepare for the vote! And it's making straight for you. Then on to Jerusalem accompanied by the Easingwold Brass Band, a rousing finale.